Per his military service record (regimental no. 6199), James O’Neill was born at Hay, N.S.W. He gave his age as 35 years, his marital status as single, and his occupation as labourer. His description on his medical was height 5 feet 6 ½ inches tall, weight 11 stone 2 lbs., with a dark complexion, blue eyes, and dark hair. His religious denomination was Roman Catholic. He completed his medical on the 17th October 1915 at Wellington, and was attested on the 19th October 1915 by Captain Nicholas at Stuart Town (signing his name on this document as James Andrew McNeill). He claimed to have had no previous military service. After completing the Coo-ee March he went to Liverpool Military Camp for training. His service record does not record details of his service for the next few months. There is separate enlistment documentation dated the 14th of March 1916 where he completed a medical and attestation at Liverpool, where he was ‘re-examined and found medically and dentally fit’. However, there is no paperwork indicating that he was discharged prior to this, and his official enlistment date according to the Embarkation Roll is the 19th October 1915. On his embarkation roll his address at time of enrolment was ‘No fixed abode’, and his next of kin is listed as his sister, Miss Kathleen O’Neill, Hay, N.S.W. On the 25th October 1916 Private O’Neill departed Sydney on the HMAT Ascanius. He arrived at Devonport, England, on the 28th December 1916. He marched into the 5th Training Battalion at Rollerstone on the 29th December 1916. On the 11th January 1917 Private O’Neill was charged with being absent without leave from 2400 on the 8th January 1917 till 2100 on the 10th January 1917. He was fined a total forfeiture of 8 days pay. On the 8th May 1917 Private O’Neill marched out of the 5th Training Battalion and travelled to Folkestone where on the 9th May 1917 he departed for France. On the 13th May 1917 he was taken on strength of the 18th Battalion when it was reorganising and reequipping at Fricourt, France. On the 19th September 1917 Private O’Neill was wounded in his first action near Bellewaarde Ridge, Belgium. He was evacuated to the 3rd Australian Field Ambulance where he died later that day. 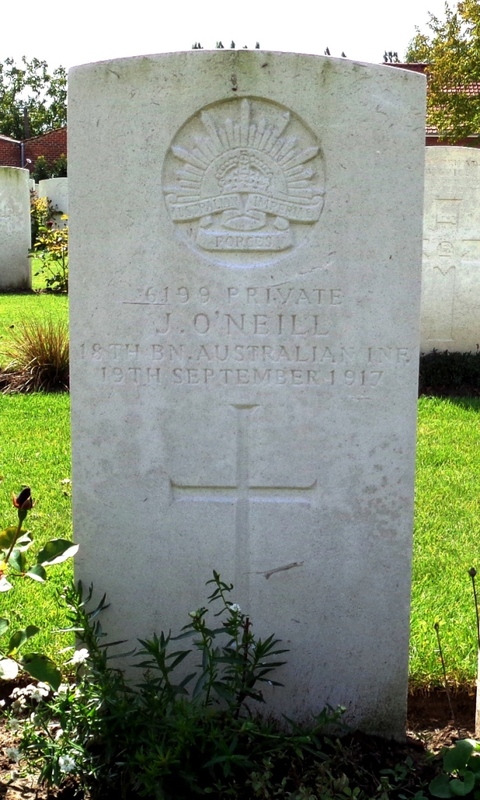 Private O’Neill is buried at the Menin Road South Military Cemetery at Ypres in Belgium.